Did you know the bomber jacket also known a flight jacket was originally created for military pilots? The style has become part of popular culture and apparel. 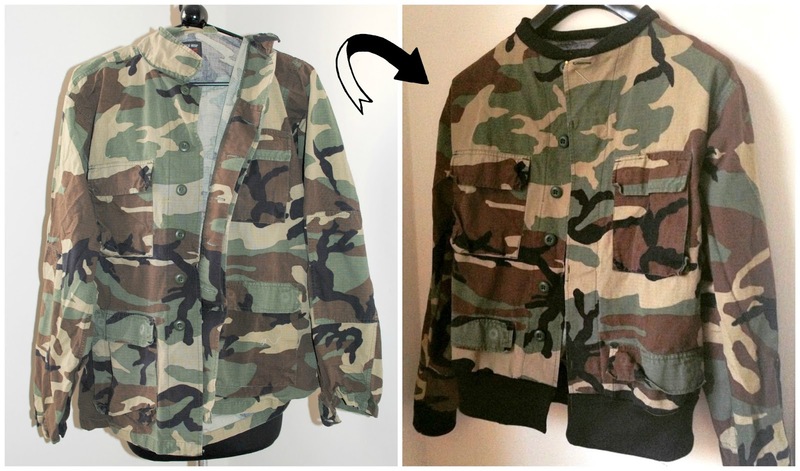 I found this oversized canvas camo shirt and wanted to turn it into a bomber jacket. Find a collared shirt with fabric that you like. I've always loved military style fabrics like the camo one above. The before shirt/jacket had a nice thick canvas as well, so it will be a great fall jacket. You can have fun with this, think florals, silk prints, sequins, plaids, anything that fits your style and the seasons. For ribbing I used 1/4 yard from the fabric store. I already made this so I'm trying to show you although already sewn. Start by removing the collar, shorten the sleeves, and hem of the jacket if need be. You will be adding ribbing so you need to shorten a few inches. If the jacket fits you well than you can skip this step. I was swimming in my jacket so I sewed the inseams right sides together through the arms and sides. I then trimmed the edges. This is not the "proper"way to tailor but fast and looks good enough. Fold the ribbing in half. Mine measured 6 inches in width so about 3 inches when folded. The length depends on your jacket length. You will then sew the ribbing folded in half around the bottom hem of the shirt right sides together. Their should be 3 layers of fabric. You will do this with the arm and collar hems as well. Trim any excess fabric and serge the edges if you have a serger. Press the seams flat and if you want top stitch into place. Accidently I came here and saw your blog, it was by all accounts great sound like prominent and more tremendous for me. She is looking dazzling in a brilliant coat and a debt of gratitude is in order to share.